panel, please fill out our contact form below. Join the Vapestreams review panel today for a chance to test and review our most popular short fill vaping liquids and a free nicotine shot! Such as, Twelve Monkey Short Fills, Nasty Juice Short Fills and so many more! After testing the product, we will contact you and ask you to leave a review via email. 1. Participants MUST be over aged 18 years – we will ask for ID. 2. No purchase necessary. 3. By submitting your details to join the review panel, you agree to use to use your review so we can publish on our website. 4. A limit of one entry per customer will apply. 5. No bulk, third party or automated entries are accepted, all of our participants will be hand selected by a member of our team. 6. If selected to trial our products, panellists will receive the full size product free of charge. 7. If selected, panellists will be required to write a review of the product by a given date. 8. All views must be your own and based on your own experience of using our products. 9. Vapestreams reserves the right to use the reviews for marketing purposes. 10. 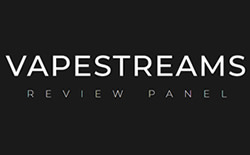 Vapestreams reserves the right to moderate all reviews submitted. 11. If you reside outside of the UK then it is your responsibility to ensure that the products that you order from us comply with the local laws applicable in your country. 12. Failure to submit the review in the given time will mean removal from the panel and will no longer be considered for future product testing.